Clark Kent (Henry Cavill) is the proverbial “all-American boy.” He’s a robust yet unassuming young man, raised by farmers in the town of Smallville, Kansas. However, he possesses extraordinary abilities which belie an otherworldly lineage. He’s actually one of the last known survivors of the planet Krypton. Though unaware of his birthright, he’s been secretly using his superhuman powers to serve mankind. Another group of Kryptonian survivors, led by fiercely militaristic General Zod (Michael Shannon), make their way to earth. Their invasive intentions require Clark to defend his adopted homeworld. Thus, an extraterrestrial savior is born. So begins the age of the Superman. Man of Steel is the second attempt in seven years to restore Superman’s box office bankability. This particular iteration comes by way of director Zack Snyder, producer/writer Christopher Nolan, and superhero scribe David S. Goyer. Snyder’s last foray into superhero cinema, Watchmen, yielded mixed results. Nolan’s fared exponentially better with his “Dark Knight Trilogy.” All three men now look to succeed where Bryan Singer failed. Can their combined talents make the “overgrown boy scout” relevant in the modern age? 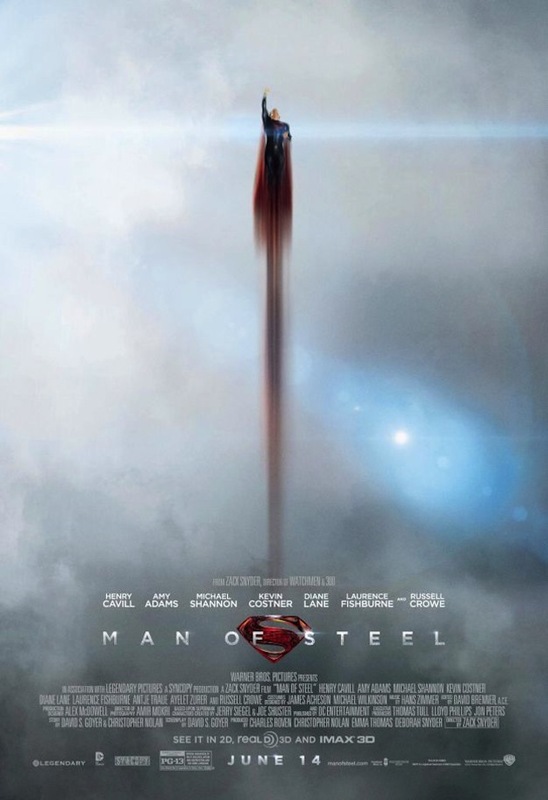 Man of Steel is Zack Snyder’s most visually downbeat film yet. Ashen/metallic hues dominate the color palette, while the sky remains perpetually overcast. The visual monotony nearly achieves a monochromatic feel. This dreariness extends even to Superman’s costume, and feels at odds with the underlying theme of hope. Much of the film is shot handheld, making it feel like Superman as envisioned by Michael Mann. The Dark Knight showed a similar affinity for Mann’s style, and reflects Nolan’s obvious influence. The action set pieces are large scale even by Snyder’s standards. The third act surely sets a new record for mass destruction. Superpowered battles extend from the streets of Metropolis to orbiting space satellites, decimating every manmade structure within range. It’s relentless to the point of overkill. Amir Mokri’s camera maneuvers are overzealous in their dynamism. These flourishes serve to conceal the obvious transitions from human actors to virtual CG stunt people. Such annoyances aside, Snyder succeeds in given the audience ample bang for their buck. His overindulgences work mostly to the viewer’s benefit. Superman Returns was largely hobbled by its reverence for the Donner films. One might think that Snyder, Nolan, and Goyer would avoid paying homage in a similar fashion. To the contrary, Man of Steel contains a great many callbacks to both Superman and Superman II. Thankfully, homage never gives way to facsimile in this case. Despite the myriad callbacks, Man of Steel remains very much its own film for the duration of its excessive running time. Nolan’s influence can mostly be seen at the story level. The first act depends heavily on flashbacks and a somewhat nonlinear narrative, as did Batman Begins. The third act has allusions to the 9/11 attacks and the subsequent war on terror, as did The Dark Knight. There’s even a touch of cold war paranoia with the “alien invasion” plot. Eugenics is portrayed as a tool of fascism. Most amazingly, the Christ metaphor (Which has long been integral to the Superman mythos) is made even more blatant than ever before. The aforementioned elements sometimes make for an uneasy fit. The nonlinear structure feels a bit disjointed, and the themes heavy handed. Still, the film never buckles under its own weight. Henry Cavill wisely deviates from the approach taken by Christopher Reeves. Reeves offered a mild mannered yet capable hero. By comparison, Cavill is a fearsome yet deeply loyal guard dog. His physical presence is intimidating, but his confident demeanor has a calming effect on those around him. The supporting characters, and by extension the viewer, realize they are in good hands. Michael Shannon offers an equally intimidating General Zod. However, he never manages to own the role in the way Terrence Stamp did. Still, he manages to provide our hero with a convincing and formidable threat. Amy Adams’ Lois Lane is a nonentity throughout. She feels like an afterthought rather than a true participant. Man of Steel flies high despite its considerable flaws. It’s a Sherman Panzer tank of a film. It’s large and clunky, yet tough and durable. Snyder and Nolan commit to their vision, and that dedication pays off. The same can be said for Henry Cavill. I suspect that the inevitable sequel will be the streamlined sports car that fans have truly been waiting for. After all, Superman II was considered by many to be superior to its classic predecessor. Likewise for The Dark Knight. Taking those films into account, Man of Steel can be considered a successful test run. The battles between Superman and the evil Kryptonians set a new standard for on-screen urban destruction, but they also give us pause: Aren't hundreds, even thousands being killed in the riveting, spectacular smashing of skyscraper after skyscraper?